Pooches and Pickups by Laurie Wisbrun for Robert Kaufman. 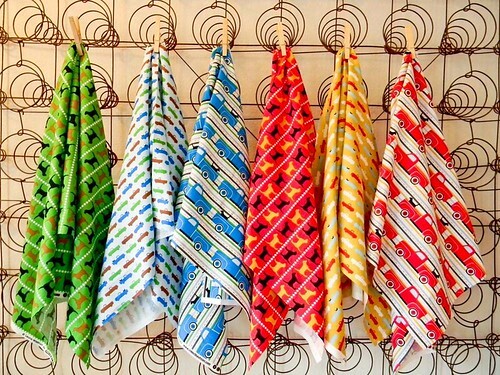 Laurie continues to delight us with her original designs and striking color palettes. I also like a well curated collection, 6 perfect prints. 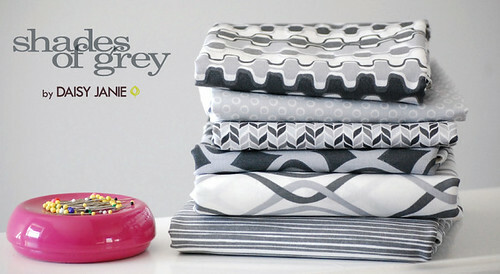 Shades of Grey is a group of six 100% organic cottons by designer Jan DiCintio for her company Daisy Janie. Simple, elegant, and beautiful! Congrats and look for an e-mail on Thursday. Every Tuesday two items from the Pink Chalk Fabrics online store will be featured and given away the following week in a random drawing. The first winner is selected from those who opened their Pink Chalk Fabrics e-mail newsletter during the week. The second winner is selected from all comments left on the blog for the week (comments from all posts, not just the giveaway post). You can sign up for the Pink Chalk Fabrics Newsletter here.